The word "Botox" is familiar to anyone who takes care of their appearances, men and women equally. Botox is a medicine produced by company called Allergan Canada. This medicine consists of hygienic and weakened Botulinum Toxin A. In cosmetology, Botox is used to eliminate facial wrinkles which are caused by active movement of facial muscles. Whenever the skin stops to unfold completely from the active facial muscle movement wrinkles start to occur. The most common place for wrinkles is the upper part of the face which is: forehead, between the eyebrows and at the corner of the eyes. It is recommended to stop using any antibiotics that prevent blood clotting three days prior treatment. It is recommended to avoid alcohol one day before treatment. Avoid any physical activity such as sport exercise and physical labor on the day of treatment. During consultation, the Doctor is evaluating the character and severeness of wrinkles. Also locates the spots of injections and the necessary amount of Botox that is needed. Just like during any injection the application of antibacterial solution is being applied on the skin. After, the Botox is being injected in to the muscles which activities need to be minimized with the help of a short and thin (0.33 mm) syringe. This procedure takes approximately 3-5 minutes. After the treatment, the skin is being sanitized and chilled. The information about the treatment and Botox such as expiry date and serial number is being written down in to the medical book in order to keep track of treatments. On average it takes 5-7 days in order for the muscles to relax, however, the best result is seen after 2 weeks. On average after the first procedure the effect lasts for 4-6 months, however after that, Botox loses its effect on muscles and the skin stops to unfold completely which results in wrinkles to start occurring again. That is why for maintaining the skin young and smooth Botox treatment is recommended every 6 months. If you find that you are waking up with headaches, you may be grinding your teeth at night. It is well-documented in the literature that Botox in the masseter muscle can relieve the tension headaches resulting from overactive facial muscles. Another side benefit is that this treatment also rounds and softens the look of the lower jawline! ASK us for details. UP TO 201 DAYS OF DRIER UNDERARMS. - That's 6.7 months of relief from severe underarm sweating. BOTOX is injected into the skin to treat the symptoms of severe underarm sweating (severe primary axillary hyperhidrosis) when medicines used on the skin (topical) do not work well enough in people 18 years and older. ASK us for details. Botox can be used to reduce your calves. Call us to book your free consultation to learn more about this new service. Never Heard Before? 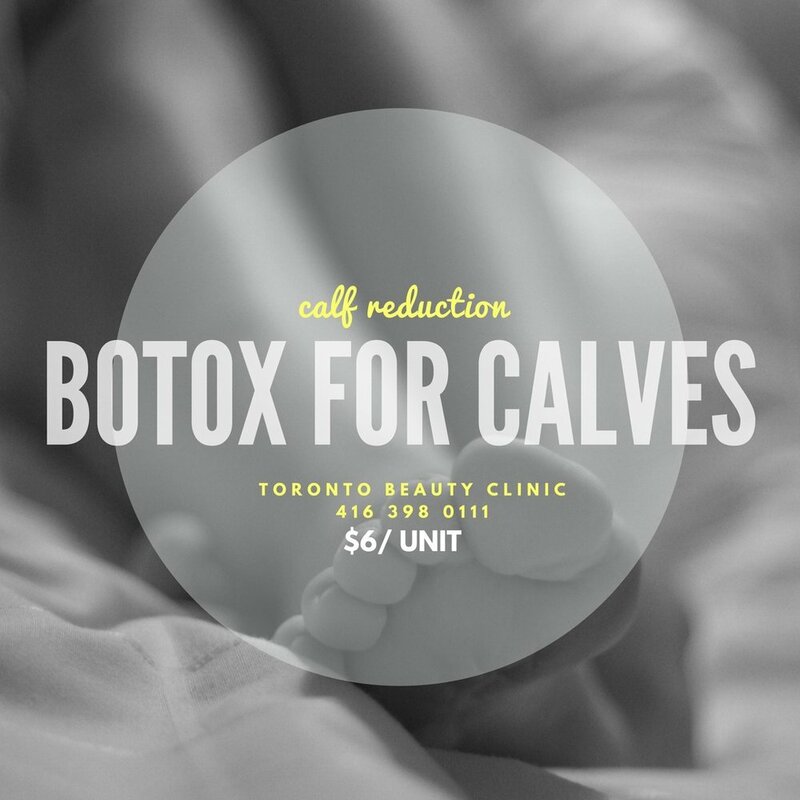 Yes, we can reduce your calves using BOTOX. Call us 416 398 0111 to book your free consultation. ONE of the Few clinics in TORONTO to offer this new service. The best way to prepare for botox is to avoid any usage of alcohol and antibiotics for approximately one week before treatment and also avoid physical exercises on the day of injections.